They have quite the unique menu. There’s coffee drinks that I’ve never heard of, as well as interesting sandwiches. I tried their Brown Sugar and Spice Latte, which was very good and not at all overly sweet, as I had expected. It was in fact more “spice” than “brown sugar” and that was a good thing. 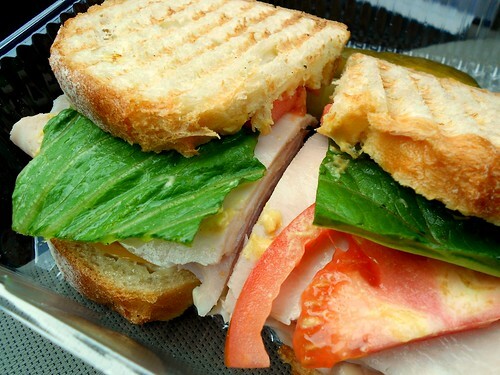 I was looking for a more traditional sandwich — just your basic turkey and cheese. Luckily for me, they were willing to change things around. I ordered their Ham & Gouda and subbed the turkey for the ham. As I came in to work this morning, I arrived in Ann Arbor early and was thinking of the best place to grab a coffee. I love Starbucks, but unfortunately there is not a convenient Starbucks on the north side of town. (Well, there’s one in Kroger’s, but that’s not *really* a Starbucks and it’s not really convenient to dash in and out.) Espresso Royal used to be my coffee place of choice many years ago, but that was more because I liked the baristas there — the coffee really wasn’t that good. Sweetwater’s is okay, but they are overpriced — and this is coming from a regular patron of Starbucks! Biggby is a little out of the way, and I like them, but their drinks tend to be rather sweet and I wasn’t sure I was in the mood for that. 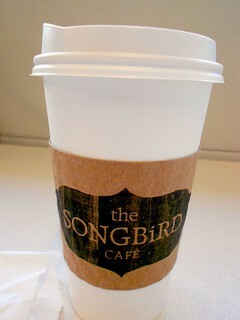 Still indecisive, I was heading toward Biggby when I suddenly pulled in the plaza for Songbird Cafe. Even though their “large” is only 16 oz — a medium anywhere else — I’d give them another try. Yesterday’s latte was good and I kind of wanted to try all the different flavors they had. This morning, I picked up a nutella mocha. I’ve tried nutella in the past and have been rather unimpressed with it, but let me tell you, in the mocha it’s great! When I walked in, the server was setting out the morning pastries and I saw one which looked good. 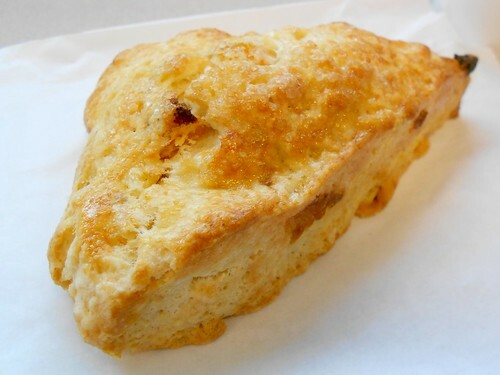 It was an apricot and almond scone. I am so glad that I picked it! It’s the perfect combination of soft and crunchy and flaky! 🙂 Yum!